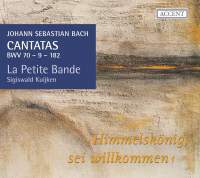 For this latest instalment in his personal selection of Bach cantatas – one for each Sunday and liturgical feast – Sigiswald Kuijken alights on three works spanning two decades. Earliest is the Weimar Palm Sunday cantata, No 182, contrasting choral movements of dancing exuberance with meditative or agitated arias. No 70 also originated in the Weimar years, though it survives only in the expanded version Bach made in Leipzig. The opening chorus is the composer in rollicking Brandenburg mode, while the Last Judgement provokes some of his most graphically operatic writing. The latest of the three, No 9, offsets an anguished tenor aria with a delicious canonic duet for soprano and alto: one of those Bachian movements that miraculously combine polyphonic intricacy with airy, mellifluous grace. Kuijken’s now-familiar one-to-a-part approach pays dividends in the dancing lightness of texture and refined, chambermusical interplay between voices and instruments. Flute and oboe d’amore frolic delectably in the opening chorus and the duet of No 9, while Kuijken himself contributes eloquently phrased and coloured obbligatos on the violin and (in No 70’s baleful alto aria) the violoncello da spalla, the light-toned ‘shoulder cello’ which Bach himself may have used. As with previous issues in the series, provisos centre on Kuijken’s choice of vocal soloists. Topped by the flutey soprano of Gerlinde Sämann, the solo quartet combine well in ensemble – though the voices can be outgunned by the very closely miked instruments. But in the arias I often craved more colour, more distinctive personality. Jan Van der Crabben’s gentle bass is touching in the hymn-like slow aria of No 70 but sounds too mild-mannered in the apocalyptic recitatives. Christoph Genz’s clean, ‘instrumental’ tenor tightens on higher notes, while Petra Noskaiová seems oddly cast in music that requires a strong lower register. A disc of mixed pleasures, then, valuable above all for the expressive contributions of Kuijken and his fellow instrumentalists.